Power Stoplight – Know when to use power! Thank you for visiting PowerStoplight.com, but this service is no longer operating! Power Stoplight was designed to help you determine when to use and/or generate power (items such as a dishwasher, air-conditioner, solar panels or wind turbines that you may have), helping both your checkbook and the environment! The pages listed above are intended to help both you with your use of Power Stoplight and Smart Power Devices with its discontinued development. November 2014: After over 4 years and over 10,000 downloads, due to a hard drive failure as well as a number of bigger picture items, Power Stoplight is no longer operating. Thank you for your dedicated use and support – it’s been fun! November 3, 2011: Power Stoplight Live launches today, bringing the power of social networking to all potential users of Power Stoplight, not just the 5,000+ who have downloaded Power Stoplight Mobile since its launch in May 2010. This unique capability means it’s now easier than ever to know when to use and generate electricity for participants in Power Stoplight’s regions’ dynamic pricing programs, via Power Stoplight Live and its Facebook and Twitter feeds. Like and Follow Power Stoplight with the above buttons today! May 27, 2011: Power Stoplight Mobile marks one year of operation! To support this free app and service, please follow the links on the right of this page to any Google Ads that may interest you. Additionally, if your organization or company is interested in sponsoring Power Stoplight through in-app messages & links or web page links, please contact Smart Power Devices via email. November 8, 2010: Power Stoplight Mobile for Android is now free for download on Android Market! This change is designed to greatly add to the Power Stoplight user base while increasing consumers’ grid & environmental awareness. Smart Power Devices Ltd is seeking partner organizations to sponsor Power Stoplight Mobile’s Smart Power Generation links that guide users to regional installation or consultation services of power generation, usage, conservation, etc. If your company is interested in sponsoring your region’s link-through page, contact Smart Power Devices with your web address and other pertinent information on your organization. October 12, 2010: Power Stoplight Mobile for iPhone is now free for download on iTunes! Additionally, Power Stoplight’s XML feed is now open for use by outside applications, devices, etc – contact Smart Power Devices for access to this groundbreaking data! August 20, 2010: Power Stoplight Mobile for iPhone is available today for free (normally 99cents)! Please help spread the word on this app to raise your friends’, family’s and colleagues’ grid + environmental awareness. August 2, 2010: Power Stoplight Mobile for Android is now available, also for only 99cents. Search for Power Stoplight Mobile from the Android Market App with keywords Power Stoplight. 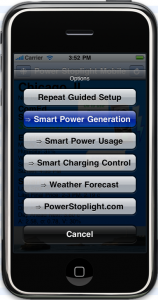 July 28, 2010: Power Stoplight Mobile for iPhone v1.10 is now available. The App features multiple improvements to the user interface including vastly improved image selection, especially helpful for some Regions’ Enhanced Image content. These plots or clock images show price vs. time in a powerful graphical format that is still very easy to understand. July 26, 2010: The Smart Power Devices Ltd Press Release for Power Stoplight Mobile, Smartphone App for Home Energy Demand Response and Power Generation Control. June 2010: Power Stoplight Mobile, the smartphone App, is now available for both the iPhone and BlackBerry platforms! Look for it in iTunes by searching for keywords Power Stoplight or by following this link. Feel free to leave any questions or comments that you may have & be sure to visit again soon!